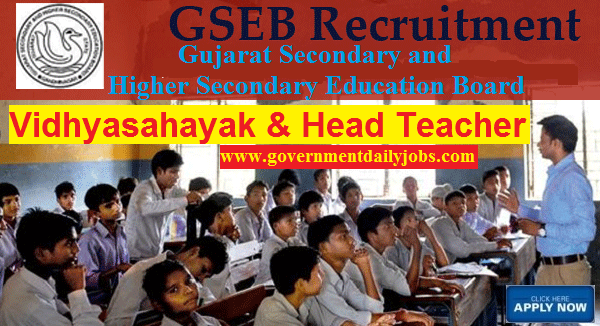 NOTIFICATION: Gujarat Secondary and Higher Secondary Education Board (GSEB), Gandhinagar inviting online applications for filling up 7000 Teaching vacant posts of Vidhyasahayak & Head Teachers in various districts of Gujarat State from eligible and interested willing candidates. It is latest & good information for unemployed personnel those who are looking for Teaching Jobs in Government sector & other organizations. 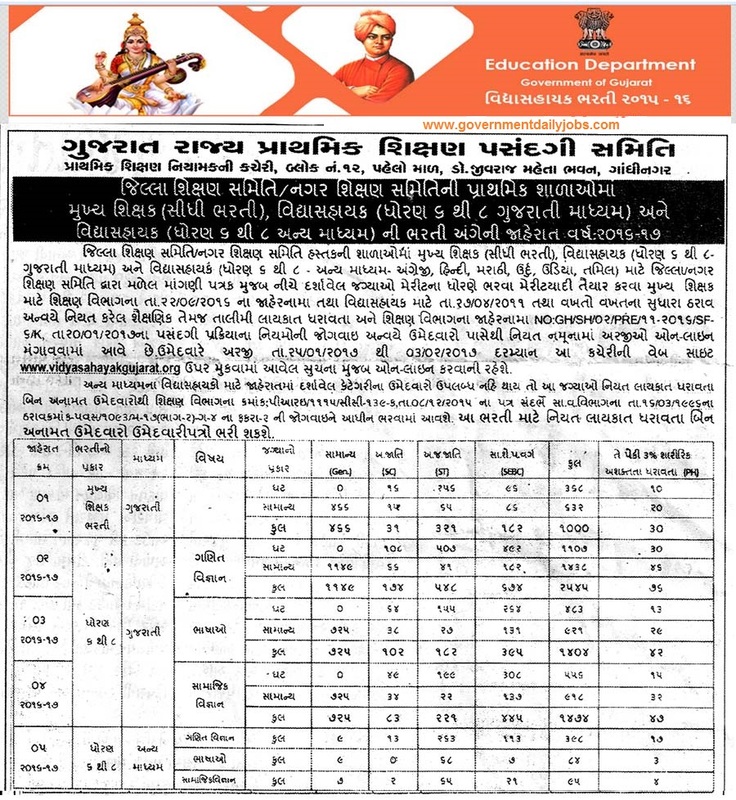 Job seekers, who wish to apply for these vacancies regarding Gujarat Education Department Recruitment 2017, must have passed Gujarat Teacher Eligibility Test (GSEB TET-II) apart from that candidate must possess the qualification of Diploma in Education (D.El.Ed) / Bachelor in Education (B.El.Ed. / B.Sc.Ed. / B.A.Ed. / B.Com.Ed. / B.R.S.Ed) with a required experience if asked. Applicant’s upper age should not exceed 33 years. As per Govt rules age relaxation is applicable to all reserved category candidates i. e.SC/ ST /OBC/PWH/Ex Servicemen/Women candidates etc. NO OF POSTS: 7000 vacant posts of Vidhyasahayak & Head Teachers in Gujarat Secondary and Higher Secondary Education Board (GSEB) Gandhinagar. a. Maths–Science – 2545 Posts. b. Social Science – 1474 Posts. c. Language – 1404 Posts. a. Maths–Science – 398 Posts. b. Social Science – 95 Posts. c. Language – 84 Posts. B. Head Teacher – 1000 Posts. REQUIRED QUALIFICATION: A passed of Bachelor’s Degree in respective discipline from any recognized University/Institute with Teacher Eligibility Test (TET) Qualification/ Head Teacher Aptitude Test (HTAT) Examination and knowledge of Gujarati Language. PAY SCALE: Rs. 5,400 – 20,200/- + GP Rs. 1,900/- for GSEB Vidhyasahayak Teacher Recruitment 2017 Apply 7000 Jobs. 2311 vacant posts of Jail Warders (Bandi Rakshak) through Uttar Pradesh Police Recruitment and Promotion Board (UPPRPB), Lucknow. LAST DATE TO APPLY: 04-02-2017. REQUIRED AGE: Candidate’s age should be in between of 18 years - 35 years. REQUIRED APPLICATION FEE: For said vacancy a non refundable application fee is to be paid by the candidates as per rules. An amount of Rs. 1000/- to be paid by General & OBC candidates through Online or KIOSK. No fee from SC/ST/PWD candidates. SELECTION PROCESS: Applicants who are screened for applicability /eligibility are being selected as per organization policy/rules depending on the basis of their performance in Merit List based on TET/HTAT Marks and Document Verification. HOW TO APPLY: For said posts (GSEB Vidhyasahayak Teacher Recruitment 2017 Apply 7000 Jobs) eligible, willing and interested candidates may apply through online mode at official website up to up to 03-02-2017. Applicants must retain a hard copy of application form for future reference. 1. Visit or log on to official web portal which is www.vidyasahayakgujarat.org or go to direct link as mentioned below. link and click on it. 3. Download official notification and refer all eligibility criteria. 4. Press Apply Online link and open it. 5. Fill up all required information related to personal, education and work experience. 6. Upload your recent size passport colour photograph and scanned signature in JPEG format. 7. Verify all entered details and then press submit button. 8. Save system generated filled form and bank challan. 9. Take a print out for future use for further reference. CONTACT ADDRESS: Gujarat Secondary and Higher Secondary Education Board (GSEB), Sector 10B, Near Old Sachivalaya, Gandhinagar, Gujarat 382043 /Phone: 079 2322 0538. CONCLUSION: Gujarat Secondary and Higher Secondary Education Board (GSEB), Gandhinagar invites online application for the recruitment of 7000 vacant posts of Vidhyasahayak & Head Teachers of Gujarati Medium on regular basis from Indian residents who are eligible & interested; candidates can apply through online application up to 03-02-2017. Candidates can download detailed advertisement /notification from official website for recruitment information like required age, reservation in age, required education qualification, required application fee, reservation for posts, syllabus, date of test,last date to apply, number of vacant posts, name of department, mode of selection, how to apply and other instructions. LAST DATE TO APPLY: 03-02-2017 for GSEB Vidhyasahayak Teacher Recruitment 2017 Apply 7000 Jobs.